Acupuncture is a method that involves using very thin needles inserted into various points in the body to stimulate bodily systems. It is based on ancient Chinese healing and medicine but has grown in popularity around the world. The technique is used primarily to alleviate pain but has other applications. Many have tried to determine how acupuncture works. It is commonly believed that it works with the body’s natural energy to relieve tension, increase blood flow, release endorphins, and modify brain activity. 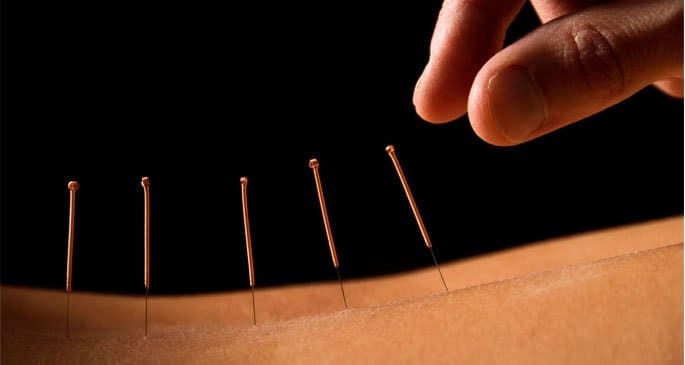 Research has shown a link between acupuncture and relief of several conditions, however, research has had mixed results in determining why or how it actually helps. Some skeptics suggest it is nothing more than a placebo effect – meaning that the belief it works is what actually causes it to work. The most common type uses needles inserted into the body at certain spots. Practitioners determine where to put the needles based on what condition they are trying to alleviate. Those receiving treatment indicate they feel little to no pain when the needles are inserted, but it can cause soreness afterward. Several variations exist including techniques that work with electricity, lasers, or burning a substance called moxa to heat the needles and warm the skin. Acupressure techniques are also practiced. This method works on the same premise but involves applying pressure to activate points rather than inserting a needle. One of the typical issues that this technique is often used to manage is back pain. It has positive results for patients suffering from chronic or long-term back pain, including low-back pain, sciatica, neck pain, and even short-term or acute back pain. A major study stated that this type of remedy worked even better than traditional methods in treating back pain that continued for more than 90 days. The technique works in conjunction with other common methods for pain relieving methods like medications, massage, and physical therapy. Many individuals turn to acupuncture in an effort to reduce their need for painkillers. Many attributes of the technique, like its ability to boost endorphins and increase the flow of blood, have been proven to aid with headaches. Headache pain is caused by overactive pain-sensing structures in the brain and increased blood to the brain and skull that cause swelling and pressure. Acupuncture helps release pressure and reduces pain sensitivity. Studies have shown that individuals undergoing treatments found relief from various types of headaches, including tension headaches and migraines. Not only can it be used to provide pain relief, but members of the study also reported having fewer headache days than those using only conventional methods for headache care. It has also been linked to relieving facial pain and dental pain, which can contribute to headaches. Arthritis is another pain condition that this method shows some promise in improving. Its ability to reduce pain and increase blood flow has a positive effect on the symptoms of arthritis. The National Institute of Arthritis and Musculoskeletal and Skin Diseases stated that the technique is a helpful treatment addition for osteoarthritis sufferers. Early research has shown that it can ease arthritis pain in the knee and other major joints. It has been tested along with steroid pills for hand and arm pain related to arthritis and carpal tunnel syndrome as well, and patients who received the treatment reported less pain for longer periods than those that were only taking conventional medicines. Another promising application of the technique is in the treatment of mental health conditions, including depression, anxiety, and fatigue. Much like modern medications to treat these conditions, this method increases the body’s production of endorphins. Endorphins are the hormones produced in the central nervous system that create a euphoric feeling that combat pain and emotional stress. Depression and anxiety are often linked to low endorphin levels, so using a treatment that increases endorphin levels can offer relief. Additional research has shown that this technique can also assist with Fibromyalgia treatments because it reduces stress, anxiety, and fatigue, two issues commonly associated with the condition. This technique can be used as an effective treatment for side effects related to cancer treatments. It has been shown to reduce nausea and vomiting caused by cancer drug treatments and chemotherapy. Studies compared this method with the drugs commonly prescribed for stopping nausea and vomiting and determined that the treatments worked as effectively. Some leading cancer treatment centers routinely use this technique as part of their treatment plans. It has also been linked to reductions in the hot flashes sometimes associated with breast cancer. To determine if this technique will be an appropriate addition to your treatment, you should consider several factors. Side Effects – This type of treatment rarely causes side effects, although more traditional methods of pain management often cause significant side effects. This makes it a good alternative for individuals who would prefer to use fewer medications. The most common side effect is puncture site discomfort. Risks – Some risks in this type of treatment include infection and deep needle penetration. Individuals with a bleeding disorder or those on blood thinners have an increased risk of complications with this technique. Medical Interactions – Because this technique doesn’t involve medication there is little risk of medical interaction. However, electrical methods could pose a problem for individuals with pacemakers or other electronic implants. Additionally, pregnant women should consult with their healthcare provider before scheduling a session. Choice of Practitioner – Practitioners should have professional training, licensing (where required by law), and be familiar with industry standards. Cleanliness and equipment sterilization should also be considered when choosing a practitioner.